Some quilts are just meant to be. 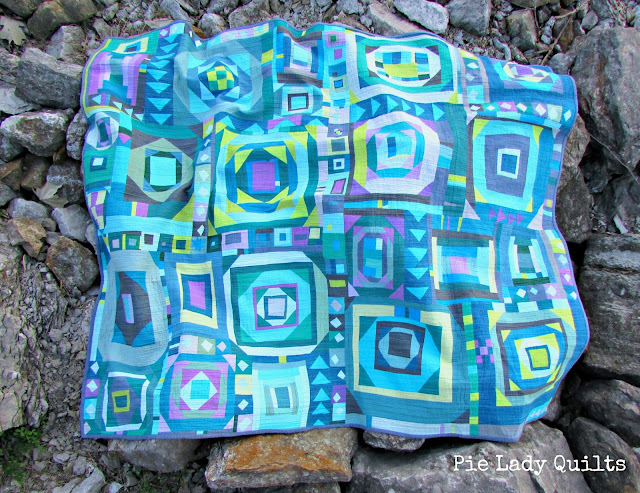 I picked out the fabrics I used in this quilt with the intention of making a pillow for the Pillow Talk Swap on Instagram. One sunny Saturday afternoon I took the stack of fabric near a bright window to snap a picture with my phone. My husband always makes fun of the people who include their toes and/or shoes in pictures, so noticing that the shoes I was wearing actually matched the fabric, I smirked and included them in the shot just for him. I really love these shoes, but, truthfully, they are a little big on me. The next day we went for a Sunday walk and in the midst of a lovely visit on a perfect fall day, my right foot stepped off the sidewalk and onto the grass. It was the smallest of missteps and disaster didn't strike until I tried to regain my balance with the bulk of my weight on the opposite foot. That's when my foot slid around in my too-big shoes, was sprained pretty badly, and I ended up as a heap on the sidewalk. In less than a second, I was surrounded by my husband and children. They were so concerned! My bleeding hands were examined. My back was patted. My pants were brushed off. Tears were shed on my behalf. The boys took turns walking their scooters next to me as I limped home. My daughter heard me tell my husband that my hands were on fire and kept pressing her cool fingers against my scratched palms to make sure I was okay. Once we got home, Daddy was carefully supervised while he helped me lay down on the couch with my foot propped up. My boys brought over the glass of water that I swallowed the Tylenol with. I closed my eyes and tried to rest. That SO wasn't happening. I didn't have my eyes closed for 30 seconds before the first child sidled up to me and asked, "So what's for dinner?" Within the space of 5 minutes, all three of them had found a time to individually approach the couch to wonder about my dinner plans. The questioning may have been a little jarring and a bit inappropriate at that particular time, but I do get a kick out of my three little foodies. I love making bread and recently have discovered Peter Reinhart's Artisan Breads Every Day. We've been systematically working our way through his recipes and the kids have been loving every minute of it. My seven year old was surprised when no one at his lunch table was as excited as he was that I'd packed a Nutella sandwich on brioche for his lunch. Just yesterday I was reading a book with some Spanish vocabulary in it to my little girl. I asked her if she remembered what the Spanish word for 'hi' was and she emphatically answered, "CHALLAH!" I didn't correct her. I think pie is pretty universal for hospitality and challah definitely counts as hello....at least in my world. So, with this experience fresh in my mind, I went back to the fabrics I had originally chosen and started thinking. What I finally decided on was that my fabric choices were very gentle and soothing. I thought it would be fun to add two more colors to work as the jarring, insistent question in that sea of quiet solicitation. I chose the hot pink and turquoise because I knew that they would vibrate next to each other. I used this combination as the center of every log cabin block that I constructed. I love how all the differently shaped centers help to create movement and make the name "Tumble" work for more reasons than just my embarrassing fall. I made log cabin units in sizes that would be easy to tile together. The smallest blocks are 2.5" x 2.5," and the largest are 6.5" x 8.5." Somewhere in the middle of piecing the 20" square I decided that my Pillow Talk partner wouldn't be receiving this as a pillow. I also decided to enlarge it to the 35" x 35" it is right now. I matchstick quilted this with Aurifil #1246 (grey). I also used the super-thin Quilter's Dream Request batting. 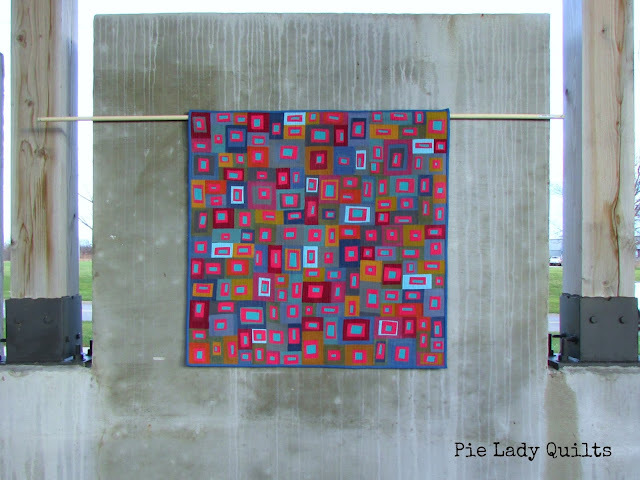 I took the quilt to the local recycling center with the awesome concrete walls (and convenient protruding bolts) for the pictures. I thought it seemed fitting for the quilt that became something different twice in its life. I also took a picture of it with the shoes that I love/hate because they seem to be cosmically linked. The coordinating socks were a happy accident. Don't worry about my swap partner, either! 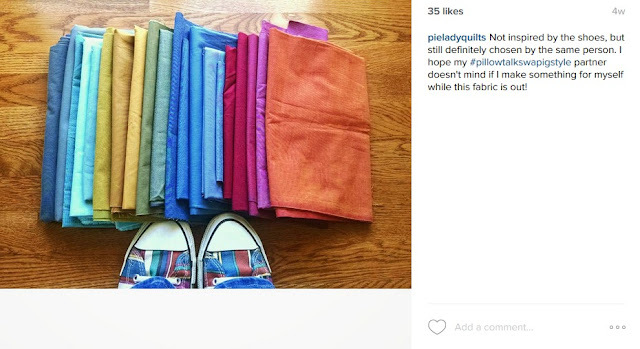 I went back to her IG wall and found a picture of a cashmere scarf that she loved. Fully intending to purchase it, but waiting for it to drop lower in price, she ended up missing out. 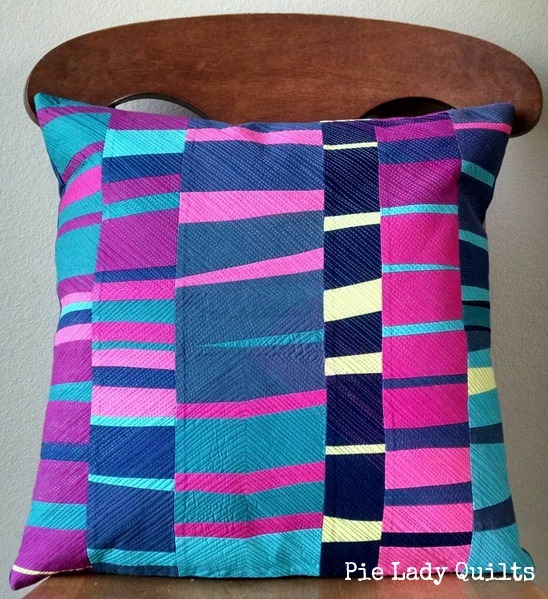 This pillow was inspired by the scarf she loved and does not own. 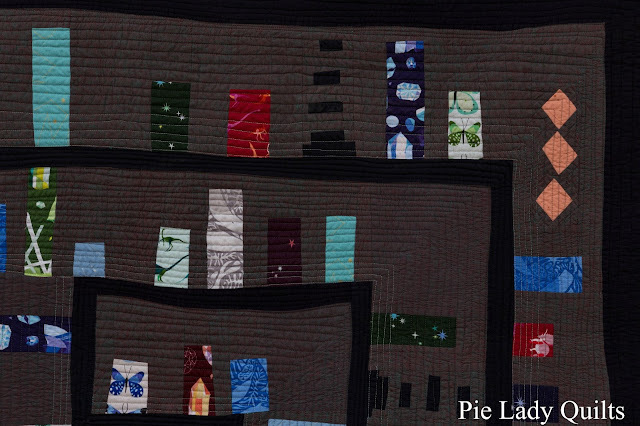 I'd like to end by sharing that my "Heading West" quilt won the Original Design category in the Blogger's Quilt Festival a few weeks ago and that "Finding Jade" was nominated for a Viewer's Choice award. 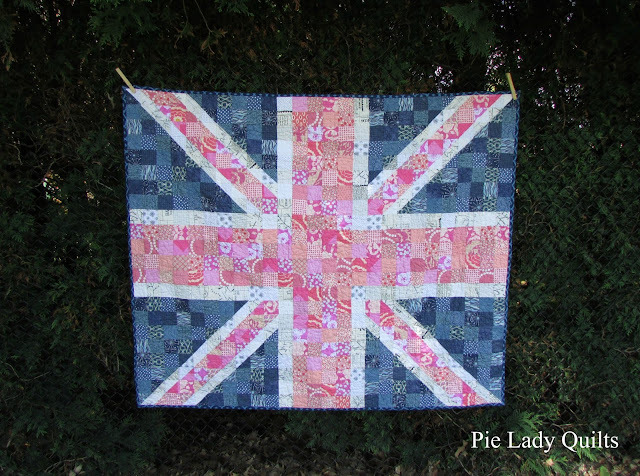 For those of you that took the time to nominate/vote for these quilts, you have my heartfelt thanks. It truly means a lot. When I was a little girl, I loved to play in my mother's jewelry box. My favorite piece was a small jade pendant that had been hand carved into the shape of an elephant. I had no special affinity for elephants then (or now), I just knew that the color was perfect and that I liked running my fingers over the smooth, cool stone. I asked my mom once if I'd ever be able to find a piece of jade that I could keep. She assured me that I could and in those hot summers when we lived in a tiny travel trailer on our farm, she would send me out into the gravel driveway to look for some. I must have picked up every green rock in a hundred yard radius. Twice. I would carry in handfuls for my mom to look at while she was making supper "No," she'd say. "Not quite. Try something lighter/darker." I wonder how many suppers she cooked with me out in the driveway scanning for the perfect shade of green. Maybe that's when I fell in love with color. I know for sure that's where I became an optimist! That memory popped right into my head when I was gifted a bag of narrow scraps from a Kona Cotton Grecian Waters collection. I haven't spent a lot of time out on the water, but I have spent plenty of time with a small jade pendant in my hand, so that's immediately where my mind went. 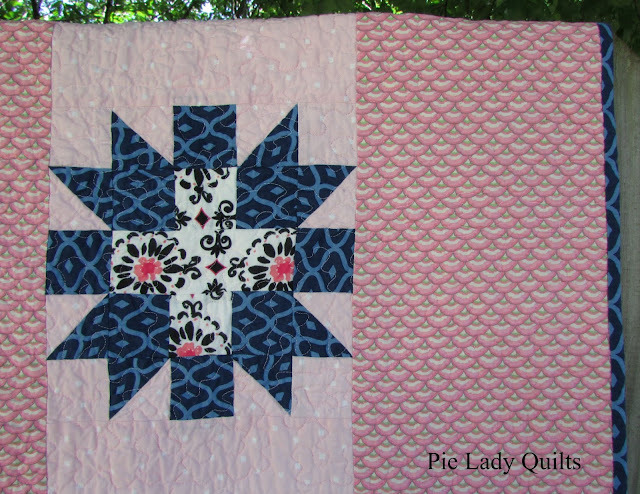 I pulled out every solid and shot cotton I had and held up each piece next to the scraps. 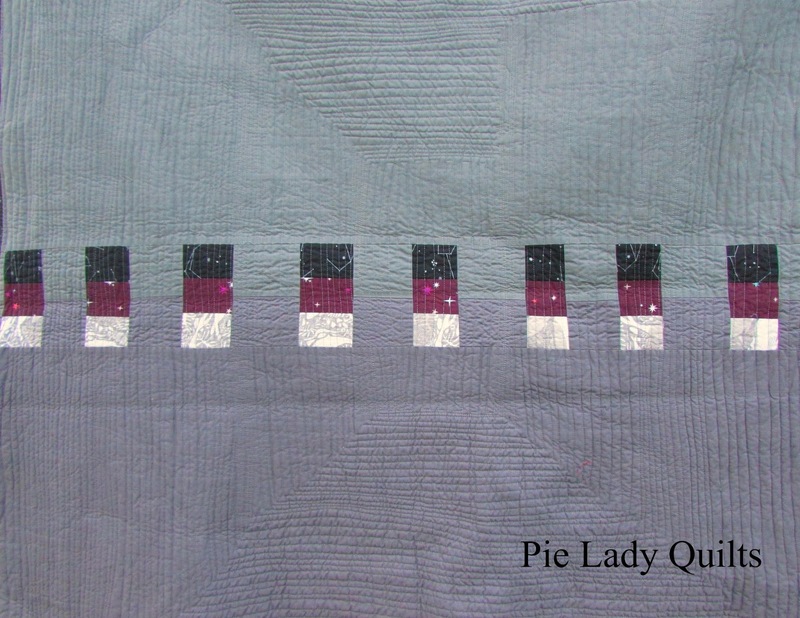 I researched the different colors jade could be, and that's how that lilac shade ended up in the quilt. I enjoy buying solids on sale and will purchase a half yard of pretty much any color I can get my hands on. That strategy paid off with this quilt since I ended up having the kryptonite greens and lavenders in my stash. Neither of those colors are ones that I would be excited to purchase in a store off the bolt, but they are the colors that make this quilt sing. My birthday present each year is a day away. My husband takes one of his personal days at work so he can watch our children and I can go to a workshop. My guild does a great job getting amazing instructors. In the last three years I have been to classes taught by Amanda Jean Nyberg (Crazy Mom Quilts), Bill Kerr (Modern Quilt Studio) and Jacquie Gering (Tallgrass Prairie Studios). This year it was Jacquie Gering. She came to teach a class on improvisational log cabins. I didn't go into the experience with any great master plan, I just figured that I would listen to what she had to say with an open mind and be inspired. As soon as she mentioned that pineapple blocks were part of the log cabin family, I got excited and wanted to get to work as fast as I could. I loved the radiating arrows in the pineapple block, and somehow those arrows felt right at home with the concept of "Finding Jade." As a little bit of fun, I did make sure to include a block that used each of the log cabin variations that Jacquie mentioned. I don't have any magic strategy tips for how I set the quilt. I made sixteen blocks of different sizes before I joined any together. Of those sixteen blocks, I put four of them aside (one ended up on the back of the quilt). The four rejects weren't ugly blocks, they just didn't fit with the direction the other twelve were going in. Later I ended up making my mom a set of oven mitts for her birthday from one of the leftover blocks. If you'd like to see them, you can check out my Instagram feed. Making a bunch of blocks in the beginning was a freeing experience. I tried to do something a little different each time I made a block, and it took me in some interesting directions. I would stop and look at the design wall after I finished each one, and I could see where I needed to go next. I keep a Post-it pad near my sewing machine and I would make notes to myself so I would remember what my impressions were if there was a break in my concentration (like needing to feed my kids breakfast and get them out the door for school on time!). Those notes helped me make work more efficiently because I didn't have to waste time reorienting myself the next time I had some time to sew. When it came time to start joining blocks, I squared the pieces down and made a note of the size. I kept track of the sizes as I built. Once I built my first unit, I knew its measurements and could build other units in appropriate sizes. The key word there is appropriate. The sections got massive and the measurements got more approximate. 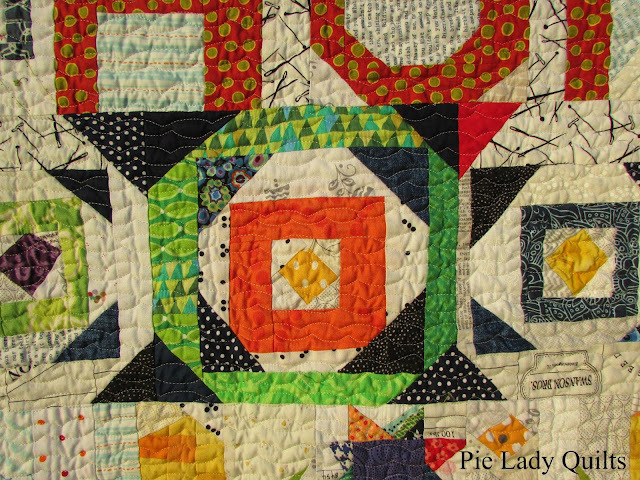 In the end, I decided that I would rather have a square-ish quilt and preserve the piecing rather than start hacking away at it with a rotary cutter and ruler. 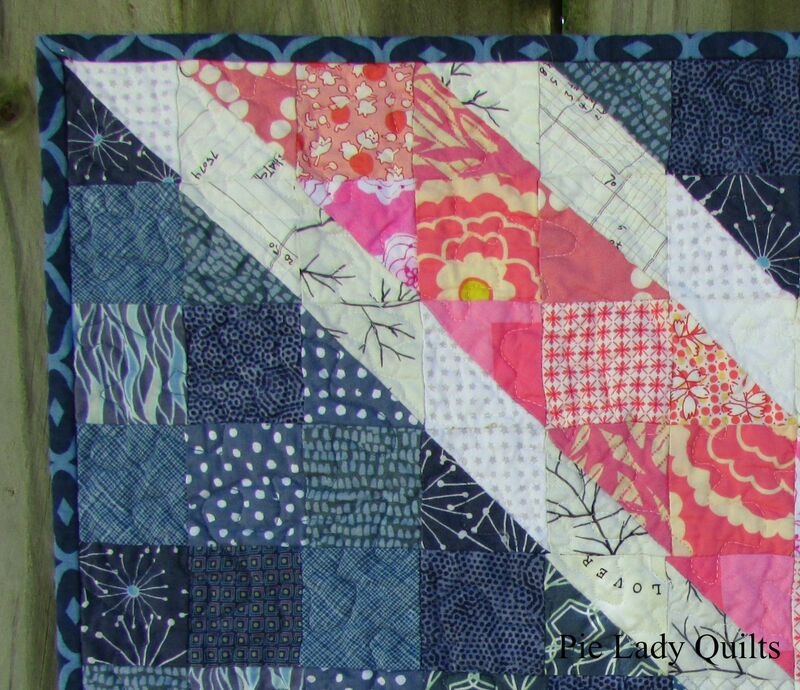 Since I've made this quilt I have experimented with different ways to make improv fit in the spaces I want it to fit in. I've gotten more proficient at piecing to a certain scale and my eyeballing has gotten more accurate. My best tip is to use starch and to press the blocks very well as you go. I love using shot cotton, but that fabric can get so billowy when doing improv. The starching and ironing seem to keep it under control. The other thing I've learned to do is to embrace the irregular. 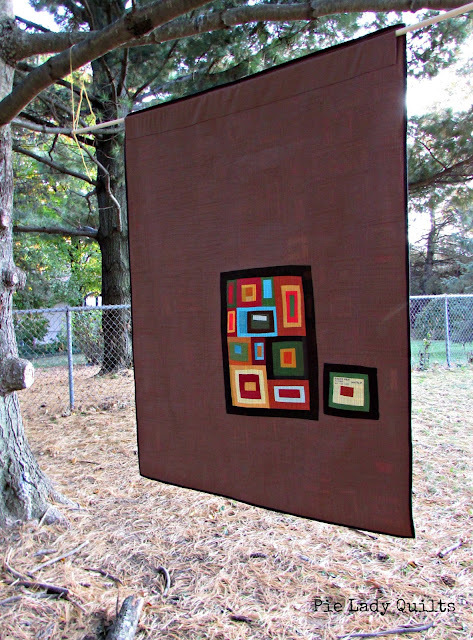 Recently, I made an entire quilt without using a ruler (except for the binding). It was a very freeing experience, plus, I learned that I really love the look of the gentle curve you can achieve when you lose the ruler. Sometimes improv can go square and sometimes it can't. I'm still exploring that difference. 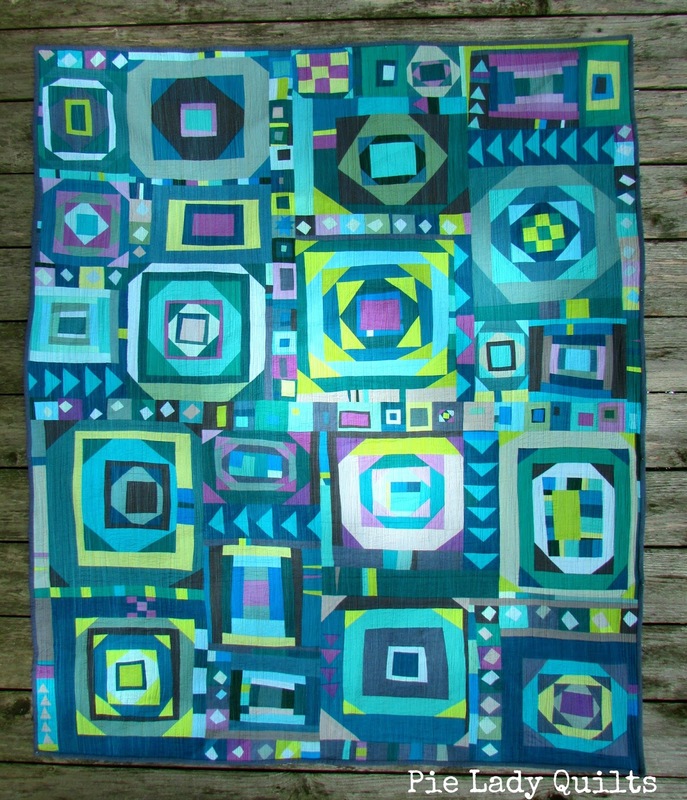 This quilt finished at 50" x 60" (ish). The thought I wanted to leave you with is this. I never found jade in that driveway. I did find a lot of great green rocks. I discovered that if I ran them under the hose, that the color changed and patterns would emerge. Somewhere along the way I figured out that I could carefully paint them with clear nail polish so that they'd stay beautiful even when the water dried. By the time I was done picking out all of the green rocks in the driveway, I had quite a collection of beautiful stones. I know that if you go out looking for beauty, you'll find it. Keep looking! It's there. I have entered this into the Modern category of the Blogger's Quilt Festival at Amy's Creative Side. I am from Idaho and every year we load up the minivan with supplies and children and start our annual trek west. Normally we go on I-80 through Iowa, Nebraska and the really barren part of Wyoming. Our boys have shown an increased interest in geography lately, so this year we decided to try a different route. We headed north to catch I-90 and went through Minnesota and South Dakota before dropping down through Yellowstone National Park (Wyoming) into Montana and then Idaho. I wish I had words to describe what a beautiful drive that was, but all I can really say is that I had my nose pressed against the window the entire time, my camera in my hand and my sketchbook on my lap. Somewhere in Yellowstone I sketched out these trees and a note to myself for the colors I was thinking of using. The design was still percolating in my mind when I flew home to Idaho later in the summer. I'm pretty sure I had my nose pressed against the plane window the entire time, too. I found the aerial view very compelling and loved seeing the landscape from a different perspective. Looking down at all those fields was the inspiration for the log cabin blocks. During my first trip out this summer, I was lucky enough to have a gift card and an opportunity to go to my mom's local quilt store in Preston, Idaho (Suppose). They have an entire wall of solids that I could choose from IN PERSON! That's a luxury I wish I could repeat more often! I took in my notes with color notations and had a fantastic time pulling bolts down to build a story with. I chose 14 half yard cuts to start, then added more from my own stash once I got home. I still had a bunch of the deep spice tones from our Marsala year and I love how those dark neutrals made the bolder choices sing out even more strongly. 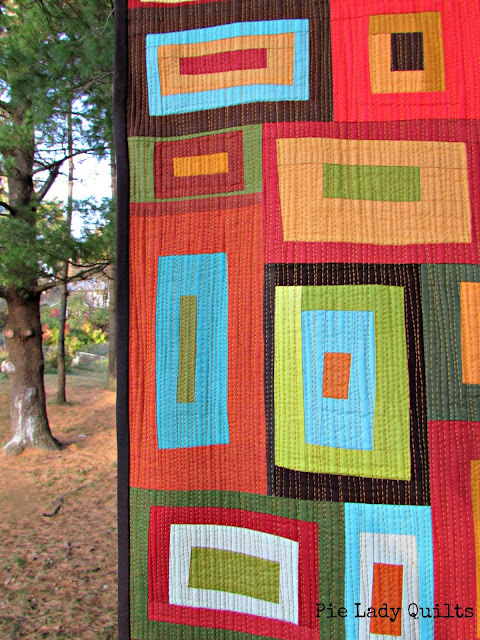 There are more than 30 different fabrics in this quilt. If you are interested, I took a picture of the palette and shared it on my Instagram wall. I was about halfway done with the piecing when I was looking at my Instagram feed one morning. I read the description for a swap mosaic and almost shot my drink out of my nose I was laughing so hard. The poster mentioned how she loved all colors and would appreciate pretty much anything, then added, "well, other than those barfy yellows and browns...but who uses those anyway??!!" I had to tell my concerned two-year old that everything was fine and that Mama was just having a "moment." She knew what that was because I'd had another "moment" not that long ago. I stopped into Jo-Ann with all three of my children in tow to quickly pick up some supplies. They were a little busy and there was a new employee on the cash register. She was struggling a bit and trying to hustle. When it was our turn, I put the zippers and basting spray on the counter and started digging in my wallet for the debit card. I was interrupted not by my children, but by the harried cashier. "Ma'am, I'm going to need to see your ID, please." I stopped digging and looked up with surprise. "Okay," I said, "What for...?" She gestured to the can of basting spray on the counter and said matter-of-factly, "...because you need to be at least 18 to buy that." I knew she was having the world's worst day and I didn't want to laugh at her, but it took every ounce of my emotional fortitude to calmly hand over my driver's license, pay and get out of the store before I was overtaken by a massive fit of giggles. It wasn't pretty. Once we were in the minivan there was plenty of wheezing, hand-fanning and eye wiping. My boys tried to put an end to it pretty quickly, but I got it together long enough to wag a quasi-threatening finger at them and choke out, "Don't you ruin my moment!!! I am going to be coasting on this one for a LOOOOONG time!!" And then I started laughing again. Carded at Jo-Ann...I love it. I cut multiple strips from each fabric in 1.25" and 1.75" widths and put them in a bucket next to my sewing machine. 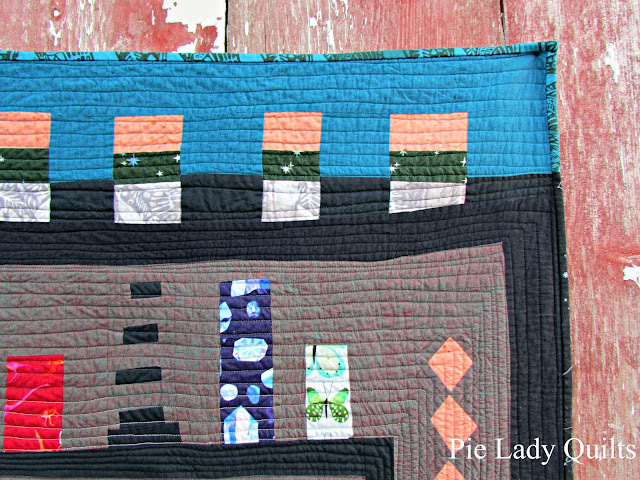 I spent at least a week just piecing log cabins. I aimed for finished sizes that would be easy to tile like 2" x 4," 4" x 6," 4" x 8," 4" x 4," 6" x 6," etc. Piecing the log cabins was great fun, but if I got tired of them, I'd take a break and do some trees instead. I discovered some really unexpected color combinations and I've enjoyed looking at the quilt and seeing the blocks that I thought would be complete disasters that I ended up loving. Just a small hit of a glaring clash can add so much interest. Once I had a huge stack of blocks, I started tiling on my design wall. I started with the trees in a diagonal set because it reminded me of the mountains, then I filled in with the log cabin blocks. I had to make a few extra at the end to get the color dispersion just right. Those were the really interesting blocks because I was setting color limits. 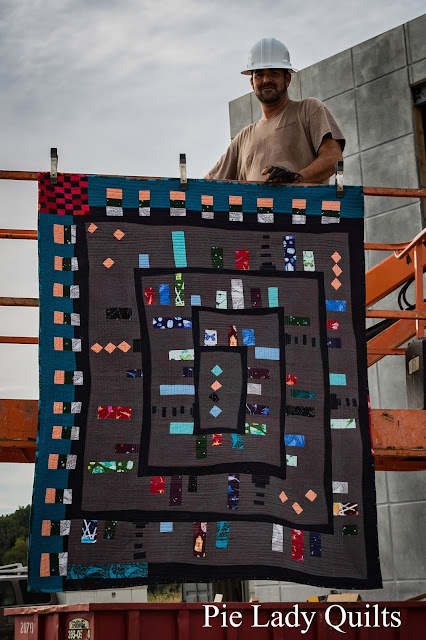 I'd think, "Okay, I need a four incher and I can't use gold, green or that really dark brown..." This quilt finished at 45" x 60" precisely because that's as big as it could get and still fit on my design wall. 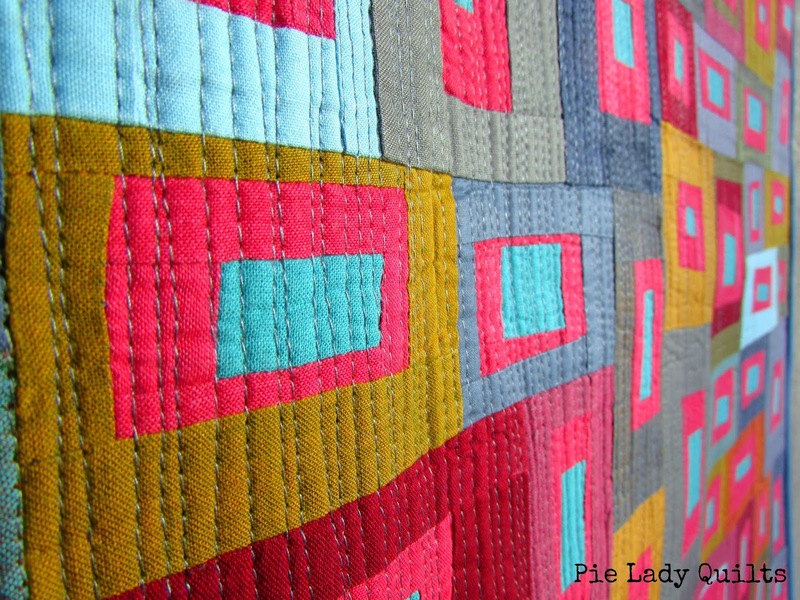 I quilted this in a matchstick design with Aurifil thread. I experimented with a different batting, Quilter's Dream Request (their thinnest cotton batting), and am happy with the nice flat finish I got. 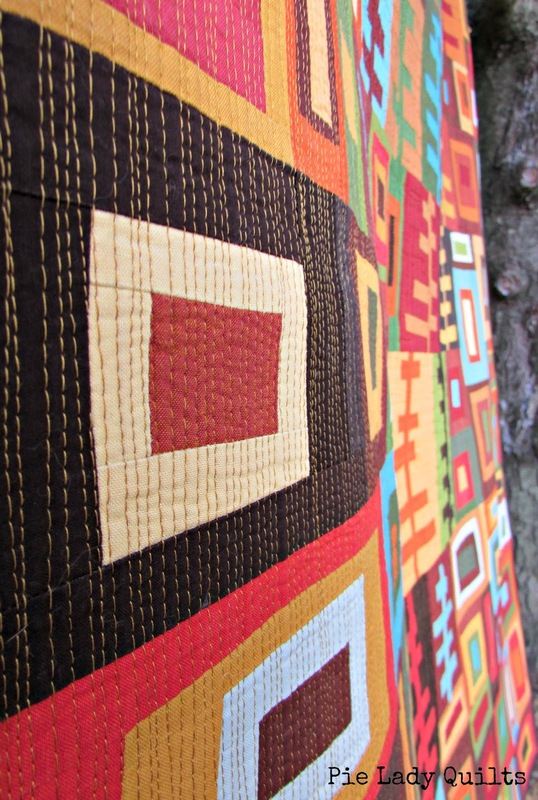 I also used an entire bottle of starch in the construction of this quilt, so it could be that, too! The other thing that I did differently with this quilt was the label. 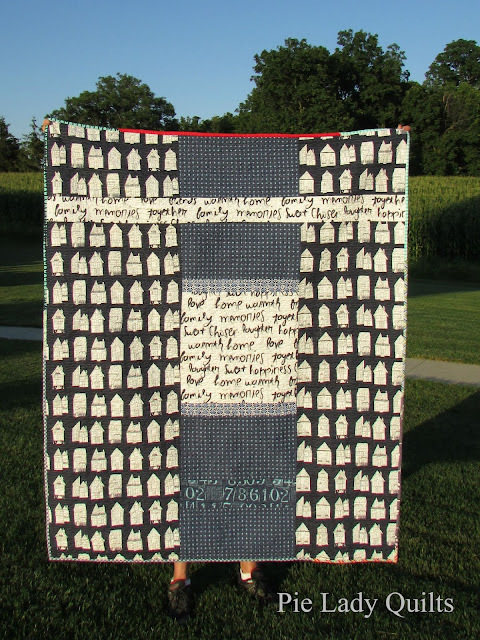 My quilt guild invited a quilt historian/appraiser to be our speaker this month and she made a powerful case for the historical importance of labeling our quilts. 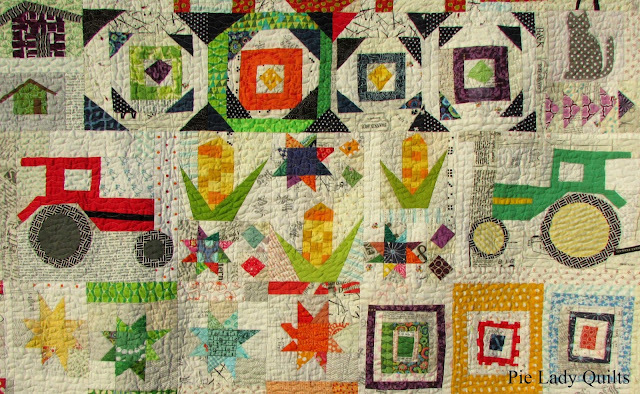 She also showed a quilt from her personal collection from every decade since the 1850s and it really put what we do in perspective. In all likelihood, the quilts we make will outlive us. Sometimes they might even outlive us by generations. Since I feel like I tell a story, I'd like those people who haven't been born yet to know who it was that was telling them that story. It's part of the legacy. 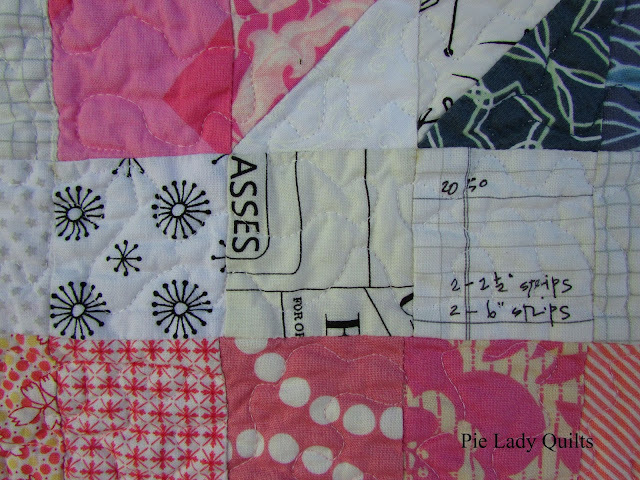 Since I'd already quilted the registration lines across the quilt and had lost the chance to piece a label into the back, I made one more block, wrote my information on it, appliqued it onto the back and finished quilting on top of it. That sucker is never coming off. 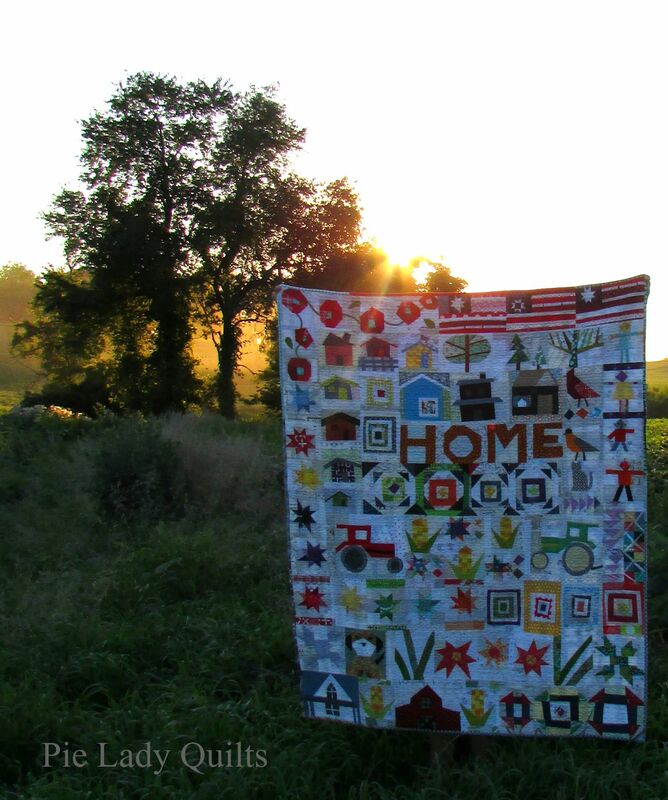 It feels good to know that the quilt and I will ride off into the sunset of history together. 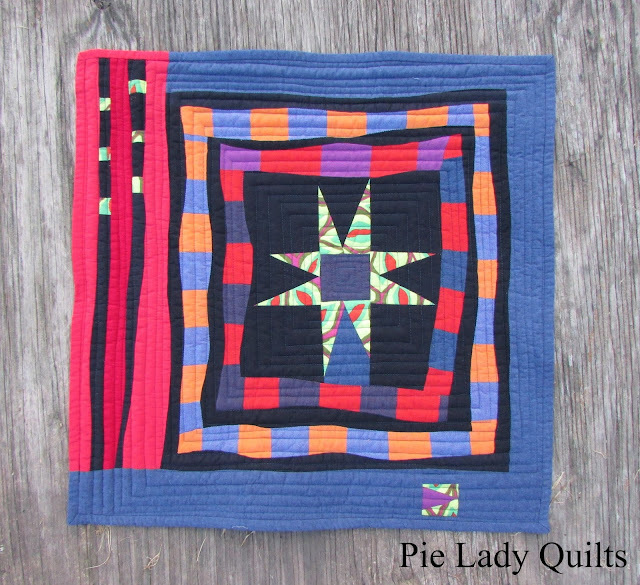 Kind of fitting for a quilt called Heading West*, right? *I really did consider Barfy Yellows and Browns, but I decided to just tell all of you instead. Can you even imagine my grandchildren trying to work that one out? 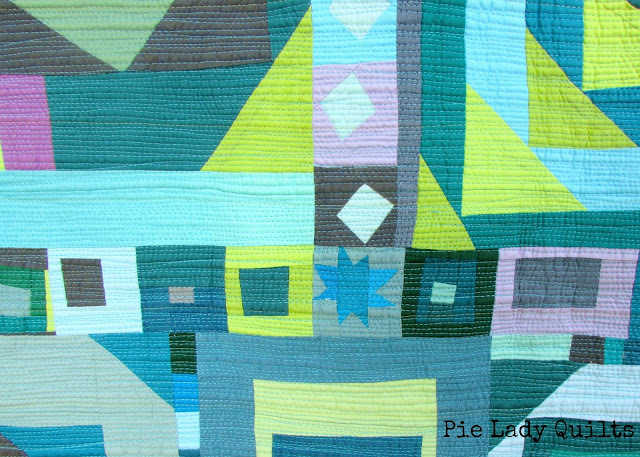 I am entering this quilt into the Original Design category in the Blogger's Quilt Festival at Amy's Creative Side. Also linking to Finish it up Friday at Crazy Mom Quilts. The back with the label. 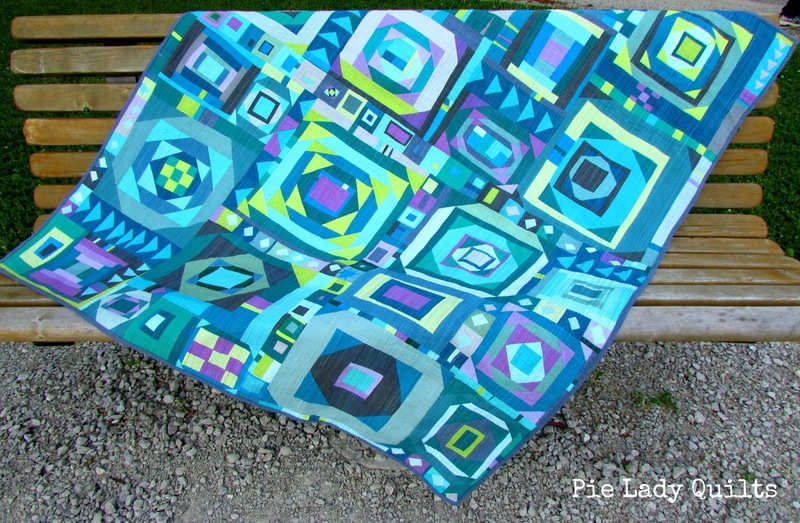 I had a plan for this quilt...and maybe that was the problem. I have a particular album that I like to listen to while I am sewing. It is a compilation album from Alecia Moore (P!nk) and Dallas Green called "You + Me." Since I'm too cheap to pay for the premium Spotify service, I get to listen to a lot of other music (and commercials) in addition to that album. Spotify likes to intersperse songs from "You + Me" with interviews from Alecia and Dallas. In one of these interviews, Alecia said, "It feels so good when it's good you know when it's not." I heard that one morning, wholeheartedly agreed, and started ripping the half-done quilt top down to components. 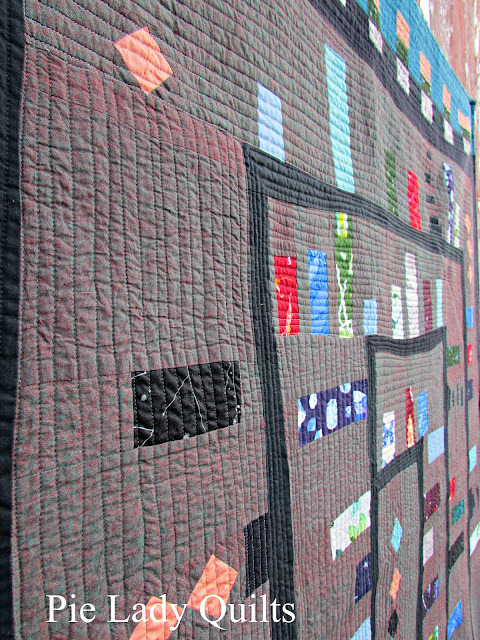 I thought Quilt 2.0 needed more black and a different setting, so I cast the plan aside, cut into some black and started piecing. I thought a radiating setting might be fun, so I tried it. I decided to not use a ruler, so I didn't. After awhile I ran out of shot cotton in Moor (the background), so I used shot cotton in Aegean on the side and the top. There was a whole lot of "what if?" in this quilt and it felt so, so good to be carried off by the process. In the end, I was gratified to see that I had literally made a path that spiraled out from the center. A circuitous, wandering, meandering sort of path that passed a lot of different landscapes, but a path all the same. 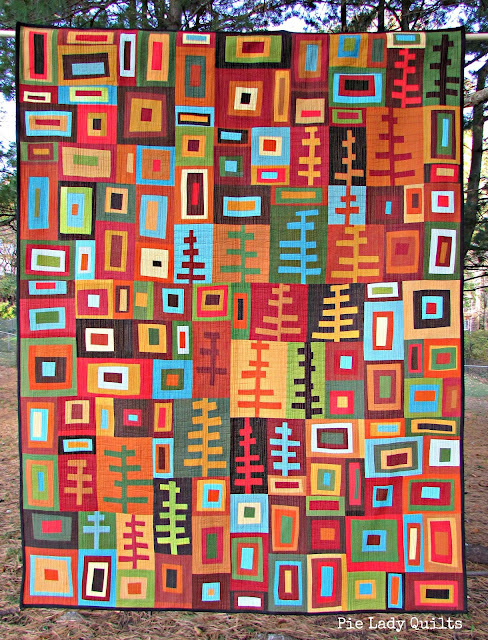 It was doubly gratifying since I had a plan in my personal life blow up while I was making this quilt. I had a lot on my mind and so much to consider. I worked my way through both problems simultaneously and got the same answer...hold on to faith and take the long road. It all works out in the end. 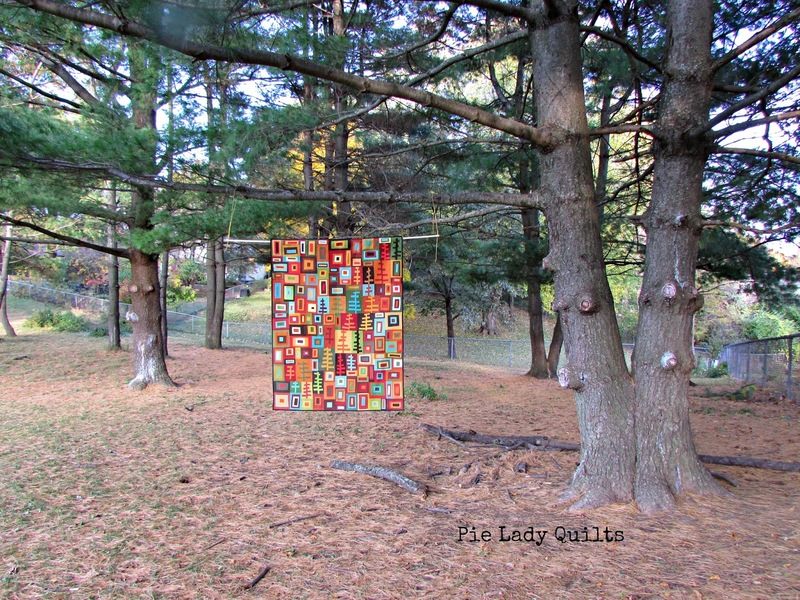 I took that lesson (and a friend) out with me when it came time to photograph this quilt. Linda and I decided to try an industrial setting and set off together with a plan. Ha ha ha! I will never learn, will I? We didn't love any of the places we had in mind and ended up at a dead end near a construction site. Linda talked me into driving onto the site and talked a few confused construction workers into listening to us. 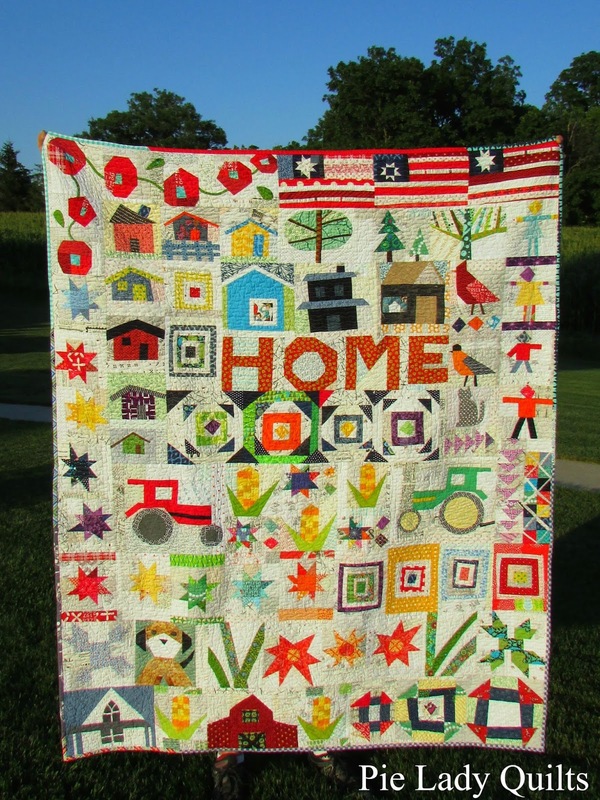 Finally a hard hat poked up over the top and shouted down, "I slept under a homemade quilt my whole childhood. I've got a soft place in my heart for quilters!" He rode the motorized lift down and visited with us for a minute. His mother is an award-winning quilter (I think he said her name was Jane Moore, but the equipment was noisy and I'm not sure if I heard him correctly). His neighbor growing up was Freddy Moran. Really? Of all the construction sites in Iowa, I pick the one that has a guy that will talk all things Freddy Moran with me. How awesome is that?! We clamped the quilt on the lift with him and Linda got the pictures. I haven't stopped smiling (or chuckling) all day. I am happy that I don't have all of life's mysteries figured out. I am delighted that I can still be surprised and I am always thankful to run into fascinating people. Your son is a kind man, Jane. 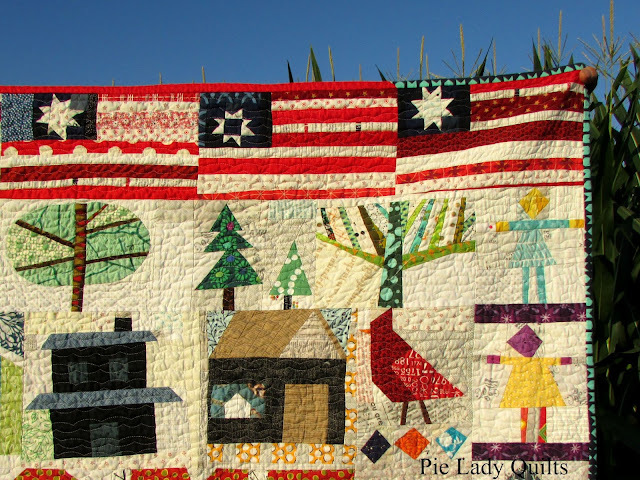 I am glad there are so many of us together on the long road who speak quilt. I used natural shaping methods to "square" this quilt. It measures approximately 52" x 66." I used Aurifil #2605 (Medium Gray), Aurifil #4093 (Jade), Aurifil #2692 (Black) and Yenmet metallic thread in #7003 (Pearlessence White). 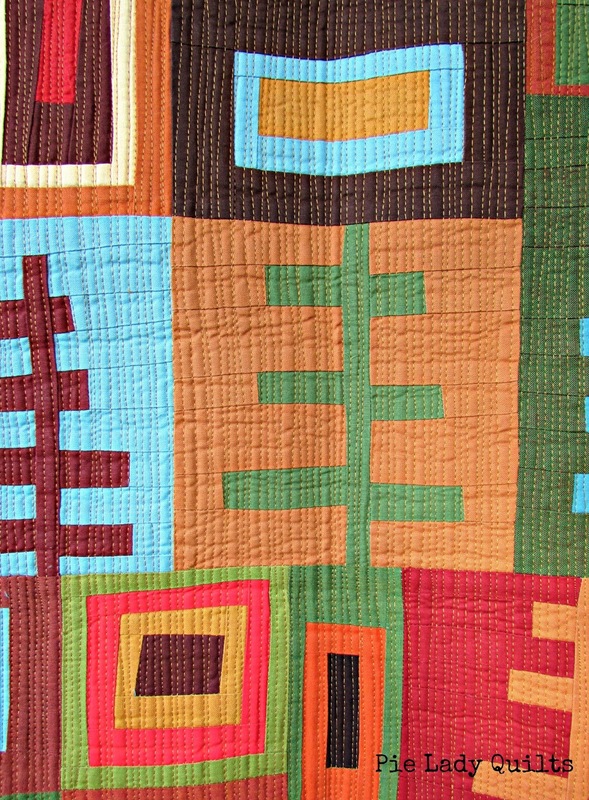 I quilted this in organic, radiating lines. All prints are from Lizzy House's "Natural History" line. I just finished reading a book called Collaborative Quilting by Gwen Marston and Freddy Moran. Coincidence? Probably not. Also a very fun book to read. Lastly, I'd like to share the mini quilt I made for the Kaffe Fassett Mini Quilt Swap. My partner requested geometry and color. I gave her shot cotton and improv. I'll know on Monday if we're both happy. 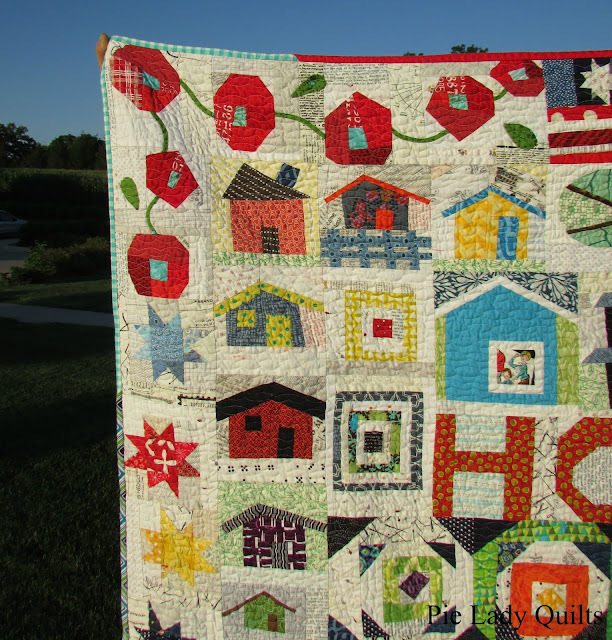 Linking up to Finish it Friday with Crazy Mom Quilts. 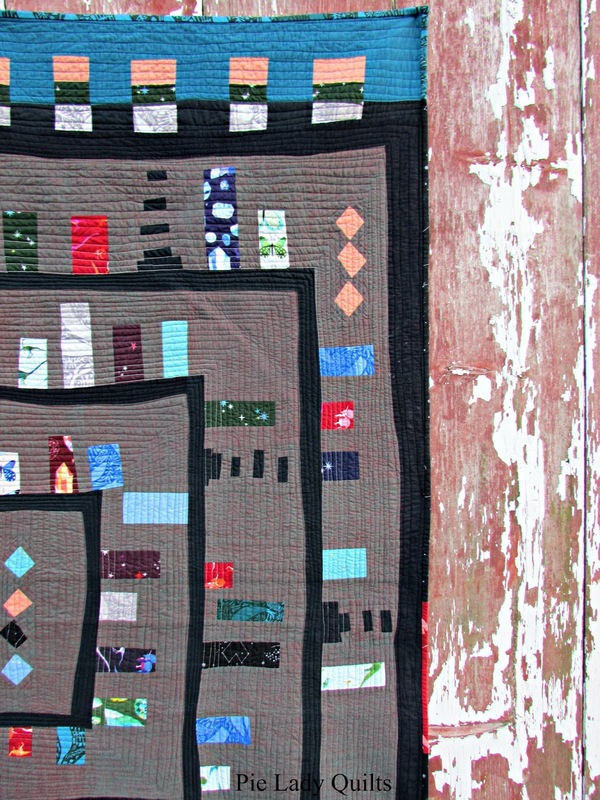 My stories end up being my quilts (and vice versa). This one is no different. I made this quilt for someone that loves following Kate Middleton, so it started out being kind of an inside joke. I grabbed handfuls of scraps and fat quarters in blue, pink and low volume and packed it out to my mom's house so I could work on it while we were visiting. Once we were there and I started cutting, I realized that I hadn't brought enough low volume fabrics with me. 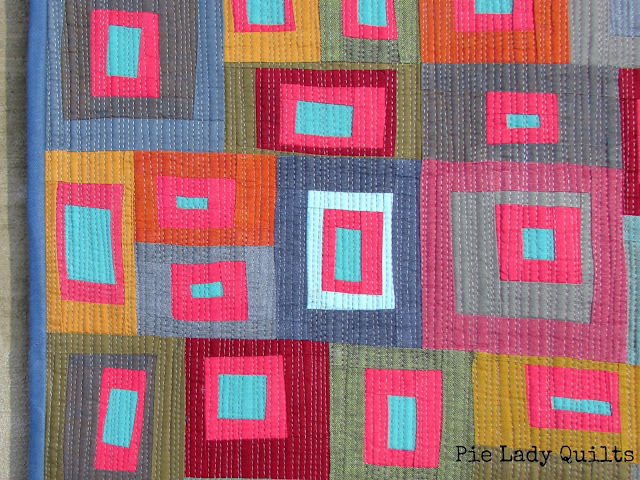 On our way to a swimming pool one afternoon, I ran into a local quilt shop and grabbed some fat quarters. One of them was a print that looked like vintage feed labels from Sweetwater Fabrics. 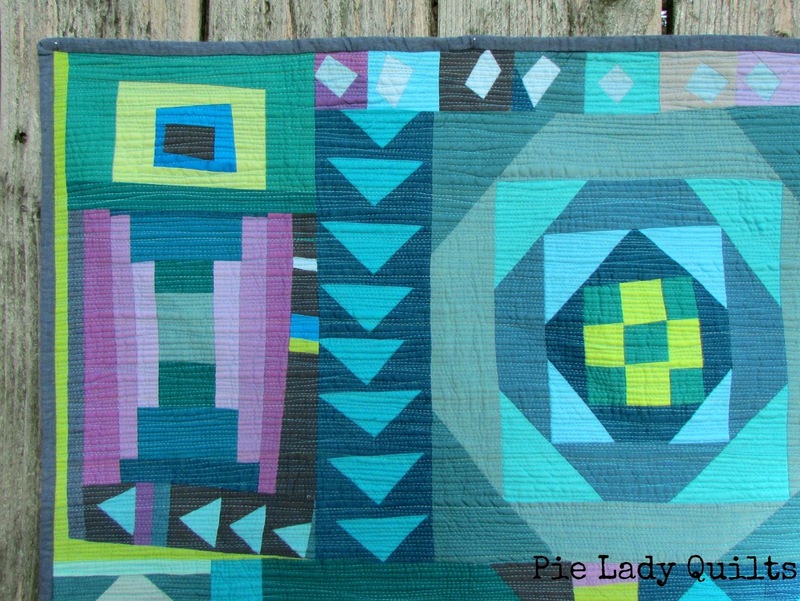 I had half the quilt pieced when I noticed what had happened. I gasped. I groaned. Then I laughed and laughed and laughed. I heard my brother yell, "What's so funny?" from the couch, so I brought the quilt out and waited for him to notice it. When he did, he laughed and laughed and laughed. Yes. Yes it does. And when they look at each other and laugh, that quilt will become a story for them and I will be satisfied. That is why I didn't rip it out. I went back to the store and bought yardage of that fabric. 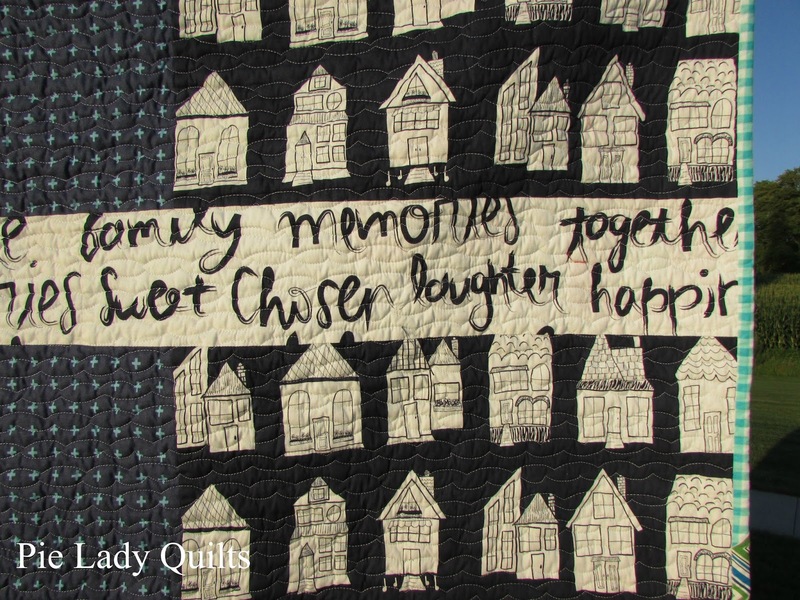 After all, serendipity happens to the prepared quilter! The quilt finished at 44" x 54." It is based on a sketch I made of the Union Jack on some graph paper. The whole thing is constructed from squares and half square triangles. It ended up being a massive amount of seams, but I divided the piecing into quadrants and did a single line at a time assembly-line style. That way I could make sure I was pressing the seams in opposite directions so they'd nest when I joined the rows. I used up a massive amount of scraps. The block in the pieced backing is called Hearth and Home. I figured that would be fitting for a baby quilt. 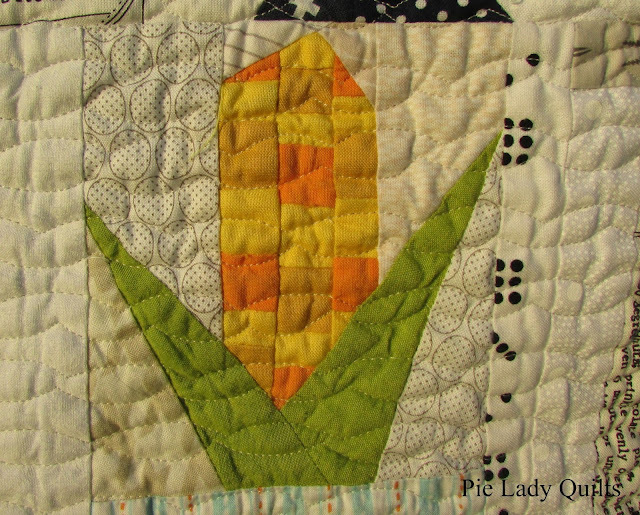 I quilted this in a stipple pattern using Aurifil thread. I used a pale pink, dusty blue and off-white. 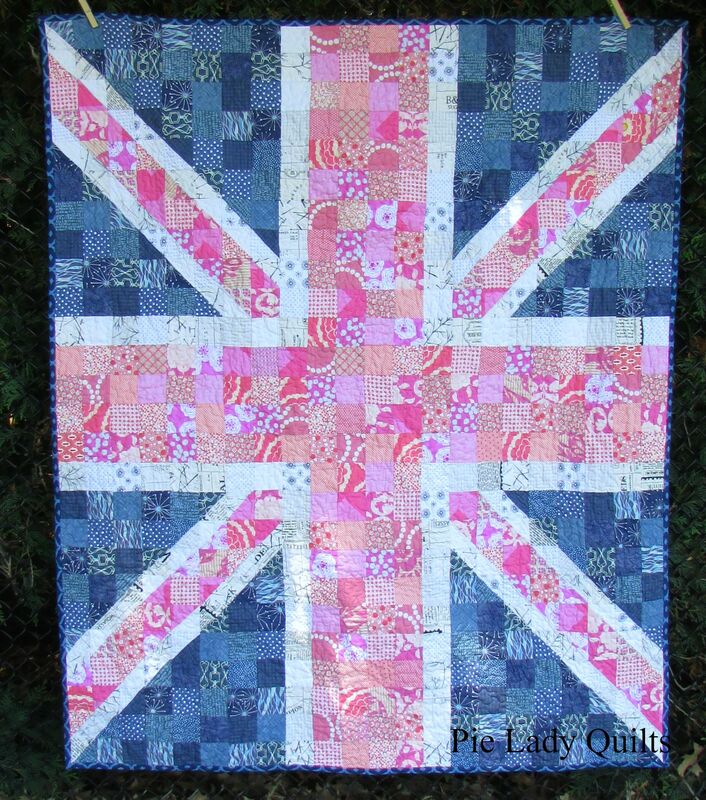 All the jokes aside, I really do hope they find this quilt is fit for their little princess! Back in May I was nominated for a One Lovely Blog Award from Kaja at Sew Slowly. I am sorry that it's taken me so long to pass it along on my blog! I really appreciate the nomination. I am supposed to tell you 7 things about myself and pass along a nomination for other blogs. Here goes. 1. I despise liverwurst. My husband loves it and I will buy it for him, but if he puts any of that stuff on a sandwich I need at least a six foot buffer zone. Gross. 2. I am six feet tall. 3. I grew up in Idaho/Utah, but I usually just say Idaho because it's a complicated story and that's where my mom lives. I live in Iowa now. 4. I love spicy food. I put crunchy jalapeno bits on my salad, salsa on my eggs and when I'm in denial about sugar I love to eat chocolate covered cinnamon bears. 5. 3 kids, 2 cats, 1 husband. 6. Pretty much every piece of jewelry I wear has a piece of turquoise on it. I especially love turquoise and pearls together. 7. My kids love to sing and one of my favorite things to do is listen to them murder lyrics. My younger son came home from preschool this year singing, "Oh Who-Sana, oh don't you cry for me! Well I come from Ala-banjo with a [something, something, trail off.....] knee. And if we're talking about recommendations for great resources, I would check out this page from Michele Bilyeu at With Heart and Hands. It is an index of liberated/improv piecing tutorials and ideas. I dare you to take a look and not be inspired to try something new. I decided to join the "Our Neighborhood" challenge, hosted by Angela from The Green Apricot, on a whim. The gist of the challenge was to make blocks (smaller than 8.5") that represented your neighborhood. Send them to Angela and she'd send you back the same amount of blocks made by others. 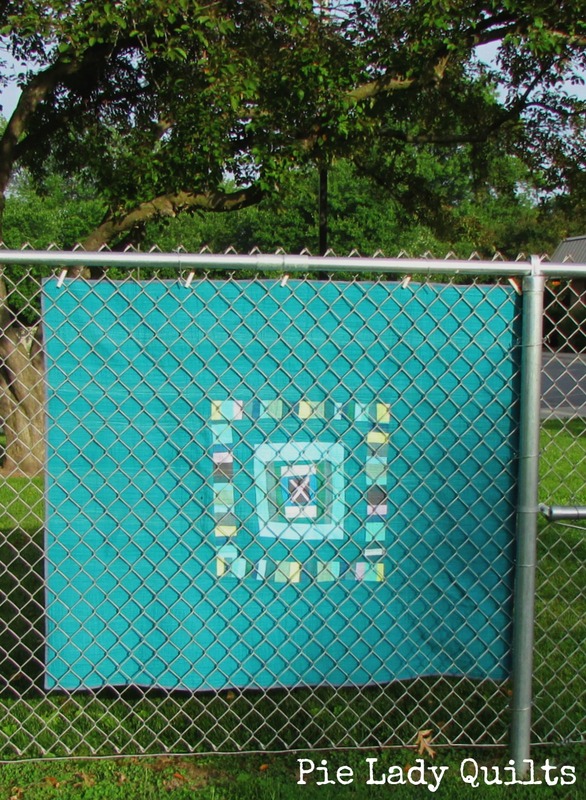 Turn your blocks into something and post pictures. Easy, right? Reading about the challenge immediately made me start considering different things, so I joined. I love the challenge of thinking in new directions and doing things I might not do if I were left to my own devices. I sent 2 cardinals, 1 oriole and 2 ears of corn. I received 3 houses, a dog, a cat and a bonus tree. I added a lot more of my own blocks and turned it into an ode to my Iowa neighborhood. I am not a native Iowan, so there are many things about my new home that surprise and delight me. 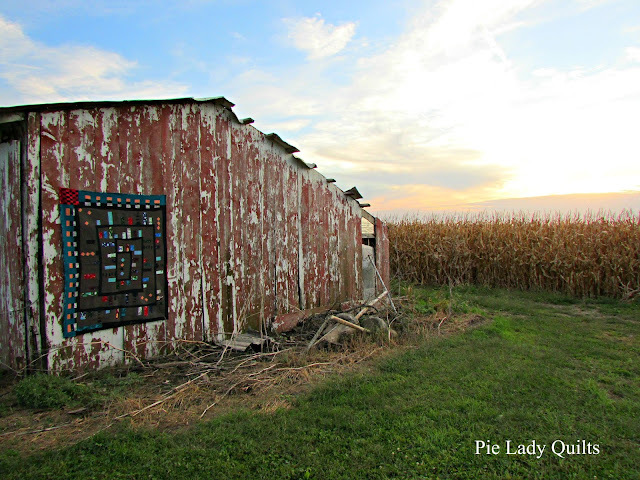 You can't go for a drive in the Iowa countryside without seeing many barns. What I dearly love are the quilts that adorn a lot of the barns. 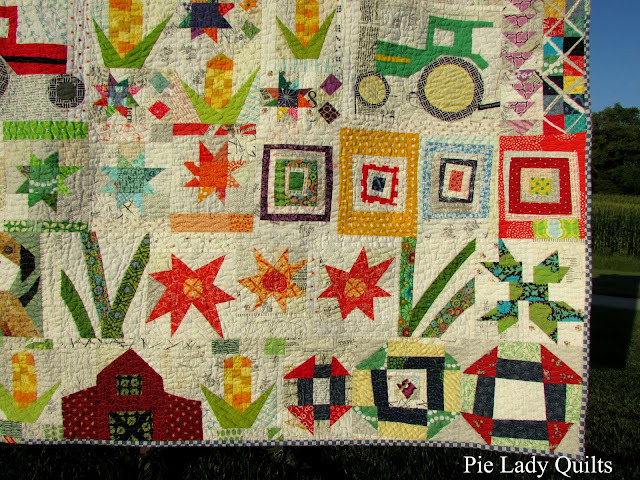 When I was planning out the quilt, I searched for pictures of barn quilts and found one with a Churn Dash that I really liked. The block in the center is an improvisational copy of my favorite. Above the Churn Dash block is an improv interpretation of a traditional block named Tulip Ladyfingers. I included this in honor of Pella, a Dutch town famous for their tulip festival. Beside that is my version of a daylily patch. Daylilies naturalize like crazy here and you see them growing in many ditch banks alongside the road. My mother enjoys growing flowers, and one that I remember her planting in front of a wagon wheel (at our house in Idaho) was a clematis. We babied it and it did grow, but kind of gave up around hip height. The clematis in Iowa explode with flowers. People plant them underneath their mailboxes and sometimes you can't even see the box! 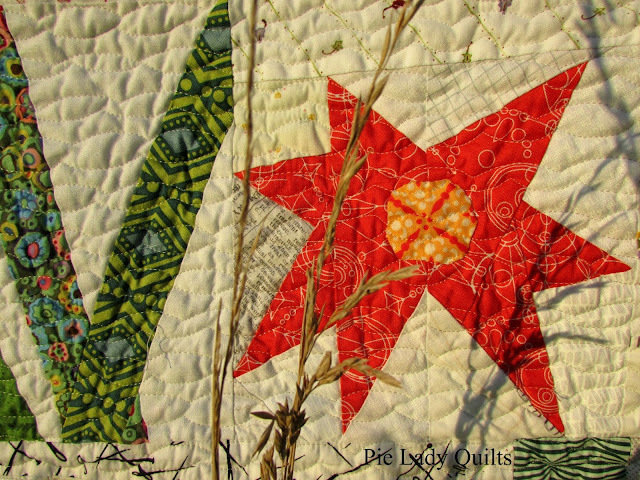 My favorite ones are purple varieties, but I felt that red worked better on the quilt so I took a little artistic license. Also included in this photo are two of the blocks that were sent to me. The Carolyn Friedlander house on the bottom and the house with the peekaboo window. I used log cabins to reference home and pineapples to reference hospitality. Iowa is a friendly place! The little kitty in this picture was one of the blocks I was sent. The corn isn't just a joke, either. I can see a couple of different cornfields from our neighborhood. 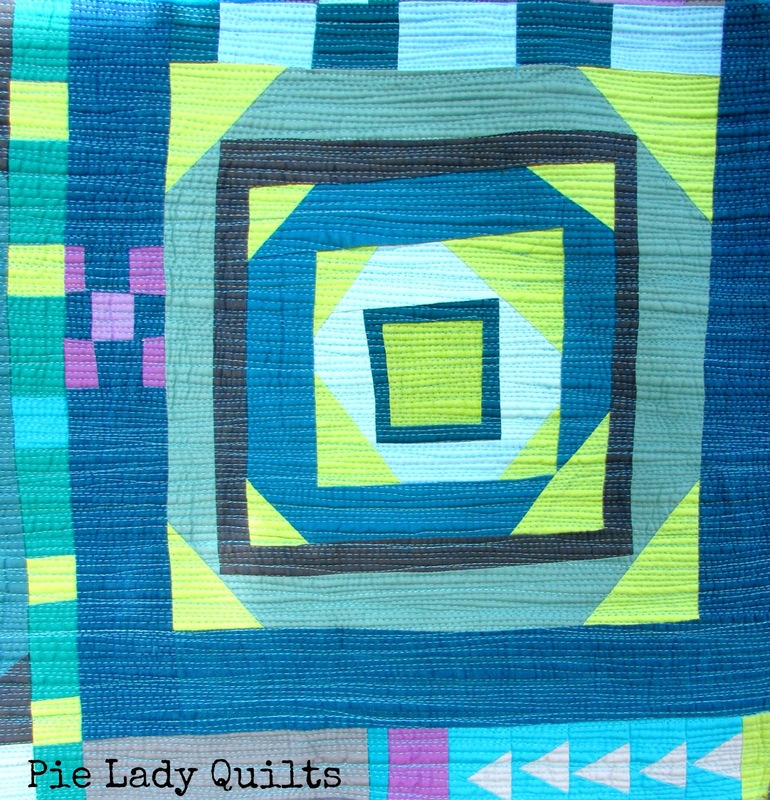 While I was piecing this quilt, I listened to some quilting podcasts. I enjoy hearing thoughts about quilting from a variety of voices. 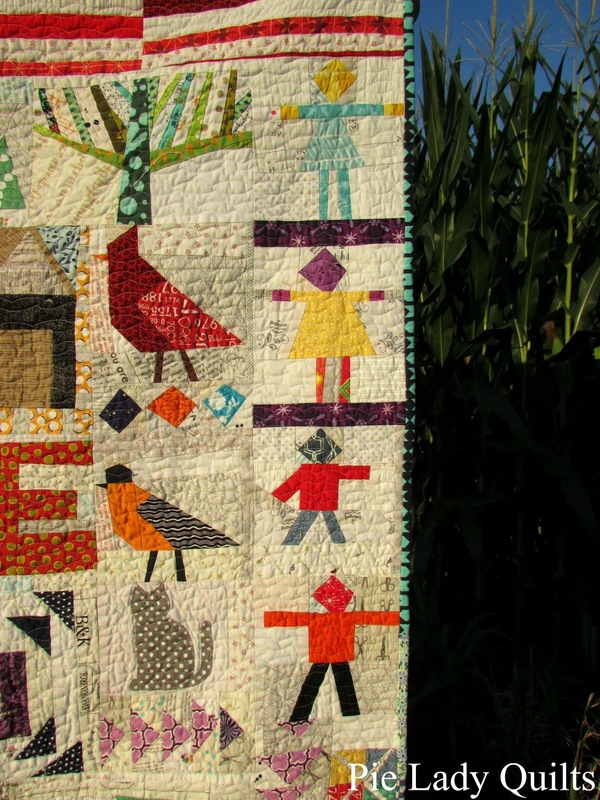 I think it's fascinating to hear why others quilt and the purpose it serves. 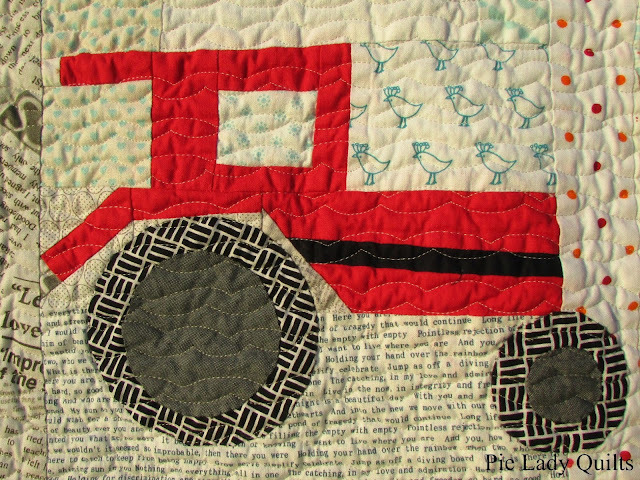 I had to laugh when the discussion on one podcast turned to expressive, statement (often political) quilts and I looked down at the tractor I was piecing. 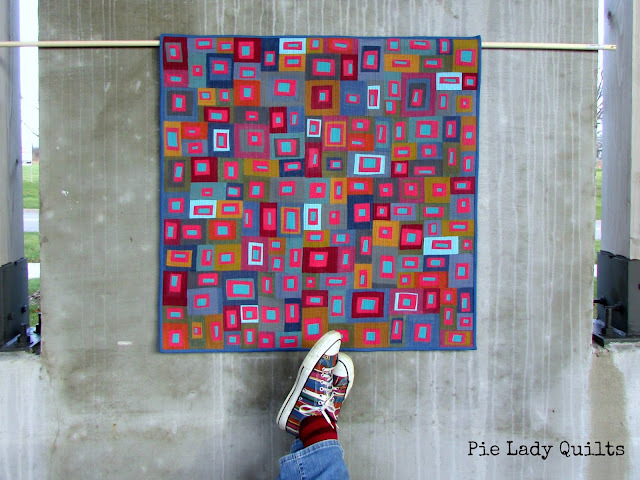 Despite its whimsical feel, this is an expressive quilt for me and reflects my perception of my surroundings. Even the tractor! There are also personal details. These are my children. I also included some of my favorite Iowa birds. Some of you *may* have picked up that I have a thing for cardinals. I don't think I will ever be able to ignore a cardinal song no matter how long I live here. I don't see too many orioles, but we discovered a place they seem to congregate on one of our nightly walking routes. The Carolyn Friedlander 'Grove' tree was a bee block. I couldn't have a neighborhood quilt without including our house! Our house is not actually blue (more artistic license), but it is a 2-story. When we built our house, my husband and I had a hard time deciding what color siding to use. We had it narrowed down to an olive brown and a dusty blue. After a lot of considering, we ended up choosing olive brown. When construction began on the house across the street from us, we mentioned to the contractor (our neighbor) that the neighborhood sure could use a dose of dusty blue....and they did it!!! I love that the house I received from the swap (the one with curtains) matched the color of our house so closely! I also included the trees we've planted, including the two mismatched pines in our front yard. Also pictured is a puppy bee block and another Tulip Ladyfingers. I almost never buy wide quilt backs, but I was totally going to for this. I cut the timing really, really close. 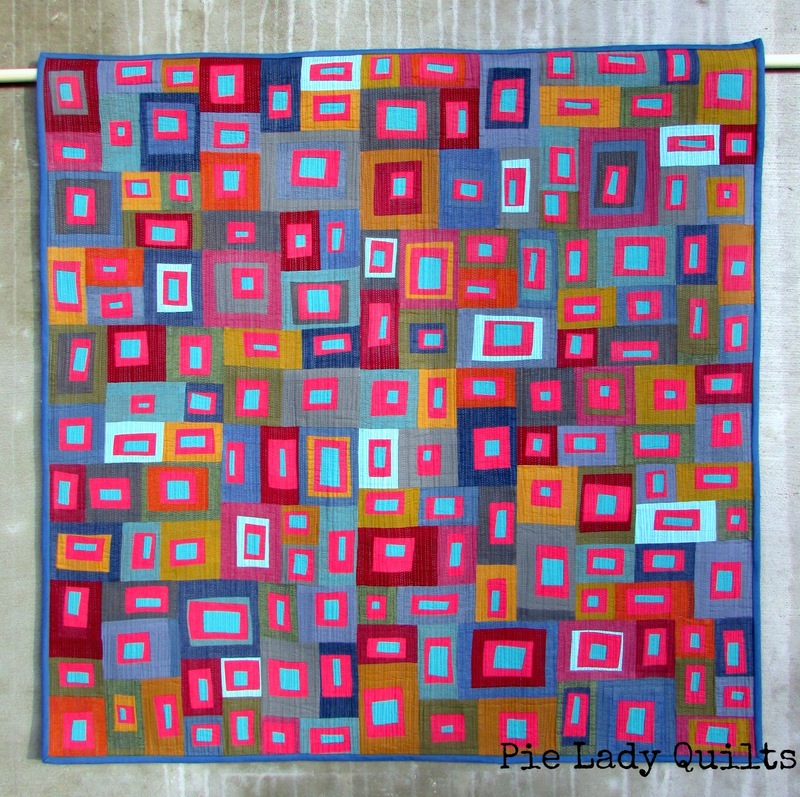 The finished quilt was due on Friday and I hadn't even finished piecing the top when I went to the quilt store on Tuesday. I was tired from too many late night/early morning combinations. To be honest? I was done with piecing. (#theheresy!) 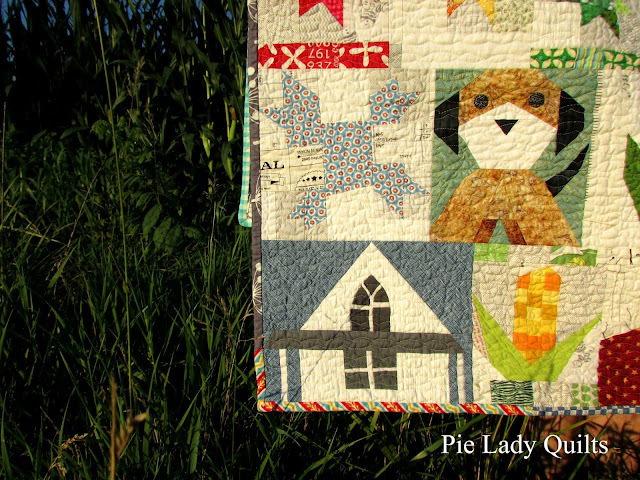 Then I saw the Happy Home line from Art Gallery Fabrics and happily pieced a back to include my two favorite prints. 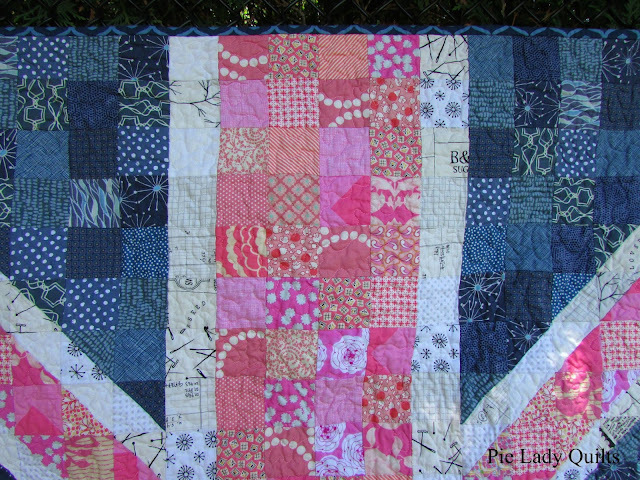 I quilted this using Aurifil #2600 (Dove) and the scallop stitch (112 on a Janome). This is my new favorite texture. Life is good here in Iowa. Linking up to Finish it Friday at Crazy Mom Quilts.